The Hapless Marionette is attracted to Standard Cheese. No Charms are required to attract the Hapless Marionette. Hunters can encounter the Hapless Marionette only in the King's Gauntlet location when hunting in Tier 1. The Hapless Marionette drops Gauntlet Potion Tier 2 as loot. The Ancient Gauntlet is a Limited Edition weapon that gives double Gauntlet Potion Tier 2 drops from Tier 1 mice. The Hapless Marionette is a puppet based on the Hapless Mouse. The thumbnail image of the Hapless Marionette focuses on the carving in the shape of a heart with the initials "L + R", which possibly refers to Larry and Ronza. 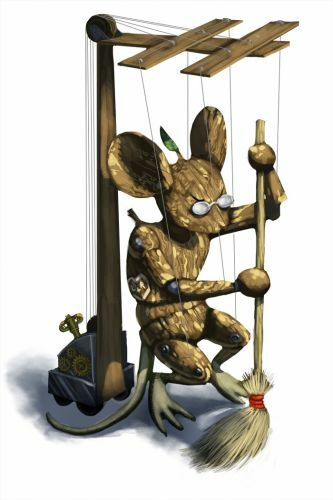 8 June 2010: The Hapless Marionette was released with the introduction of the King's Gauntlet as part of the MouseHunt v3.0 update. This page was last edited on 16 February 2018, at 03:46.